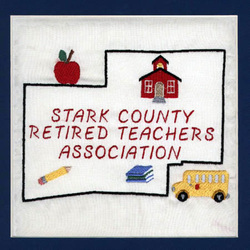 The Stark County Retired Teachers Association was organized in January 1959. Since 1975 we have held four meetings per year in March, May, September, and December on the second Friday of the month. We meet for a luncheon at Trinity United Church of Christ. A variety of programs are planned. We work closely with our legislators and they speak at the meeting frequently. Chapter members are encouraged to bring food and paper products for the Salvation Army and eyeglasses for the Lion’s Club. We have two scholarship funds that provide money for college Juniors and Seniors. Christmas cookies and messages are taken to members in nursing homes and those who are shut-ins. A memorial service for deceased members is held each year. All teachers of Stark County are welcome to our meetings and to our activities.